The quality and performance of hiop sports camshafts is the result of our many years of experience developing profiles for road, rally and race applications in co-operation with our valued customers.All hiop cams are manufactured from high quality blanks which are machined, hardened and ground to the highest German standards, to ensure our customer high performane and trouble free operation. 230225710 E30 M20 6 cyl. Camshaft, Exhaust, Computer program. 230418710 E30 M42 4 cyl. 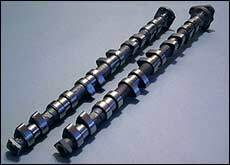 Twin Cam Camshaft, Exhaust, Computer program. 234225710 E34 M20 6 cyl. Camshaft, Exhaust, Computer program. 234235710 E34 M30 6 cyl. 2.8/3.0/3.5 Lt. Camshaft, Exhaust, Computer program. 234425710 E34 M50 6 cyl. Non Vanos Camshaft, Exhaust, Computer program. 234426710 E34 M50/M52 6 cyl. Vanos Camshaft, Exhaust, Computer program. 236218710 E36 M43 4 cyl. Camshaft, Exhaust, Computer program. 236419710 E36 M44 4 cyl. 318ti Camshaft, Exhaust, Computer program. 236428710 E36 M50/52 Vanos 325i/328i Camshaft, Exhaust, Computer program. 236421701 E36 M50/52 Vanos 320i/323i Camshaft, Exhaust, Computer program. 236425710 E36 M50 Non Vanos 325i Camshaft, Exhaust, Computer program. 236420710 E36 M50 Non Vanos 320i Camshaft, Exhaust, Computer program. 236418710 E36 M42 318is Camshaft, Exhaust, Computer program. 236619710 E36 Z3 1.9 Camshaft, Exhaust, Computer program. 236628710 E36 Z3 2.8 Camshaft, Exhaust, Computer program. 239428710 E39 523i/528i Camshaft, Exhaust, Computer program.